Lucia Beachfront Villa is a 4 bedroom villa situated in the amazing Amuk Bay, one of most beautiful places in Bali. The Villa is located few minute drive from Candi dasa where there is a lot of restaurants and shops. Lucia Beach front Villa is a very large and luxury place. Prestigious neighbors include two of the best resorts in Bali, Amankila and Alila Manggis. 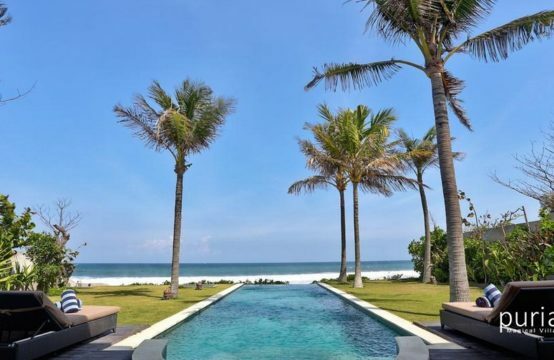 The Villa is just over an hours drive from Bali’s International Airport when traffic conditions are good, 15 minutes from the ferry port at Padang Bai, half an hour from the Bali Marine Safari Park, and about 40 minutes from Ubud. All the Rooms at Lucia Beach front Villa are wide and all are facing the sea. It is very tastfully decorated with a mix of modern and real antics furniture. In the garden there is a very convenient bale Alang Alang roofs. There is private stairs give you an easy access to the small lagoon in front of the villa for swim in the sea or do the snorkeling activity. The staff of the villa is perfectly trained and will friendly take care of you. The villa boasts of four, air-conditioned bedrooms which feature private terraces that allow you to enjoy the stunning beauty of Amuk Bay straight from the comforts of your spacious rooms. Each of the bedrooms is furnished with a comfortable, king-sized bed and comes with space for your luggage and a comfy armchair for you to relax on. The rooms are decorated with simple artwork and they feature a white-themed design. All four bedrooms have en-suite bathrooms that come with luxurious tropical shower areas. Ascend the luxurious stone steps from the garden, to reach the spacious two-storey living pavilion. Completely white, including the walls and the furnishings with added pops of color here and there, the living area is a comfortable and inviting space that is well-furnished to accommodate all the guests of Villa Lucia. Right in the center, facing the large doors that look out to the pool and then the endless seas, sit the couches and armchairs where one can lounge and relax after a long day. To the side there are other daybeds and floor sitting for you to lie back on. Up a step, there is the 8-seater dining table with white long-backed chairs for you to enjoy your meals with your loved ones. When you ascend the staircase to the upper floor, you will reach the terrace, with an all-glass wall and doors, which has the best view in all the villa. The living area is minimally decorated to highlight the beauty of its surroundings. The outdoors at Villa Lucia are straight out of the glossy pages of a magazine with a 20-metre swimming pool sporting an infinity-edge. Beyond the pool, lies the infinite sea, the mountainous islands and the clear, blue skies as if meeting the waters of the pool and giving you a rush of adrenaline being surrounded by so much untainted beauty. The lavish pool is accompanied by deck chairs that are covered by large umbrellas to keep you in shade, but if you desire you can always sunbathe. On one end, the pool is joined by a lagoon under a traditional, thatched-roof bale, and on the other, you will find an alfresco dining area with an enviable view. The well-manicured lawns that lie just behind the pool add its own charm to the surroundings and exude a serene and calm feeling.